This post is for the luxury high-rollers who want to spend. In comparison to our other posts about Bluetooth speakers, we usually talk about Bluetooth speakers which are cheaper, but we wanted to switch it up. We wanted to show some appreciation for wireless speakers. And the reason for this is because of the quality. The difference between Bluetooth and wireless speakers is wireless speakers can connect to the internet. It makes streaming and playing movies easier. If you don’t have a phone with a streaming app then it’s more difficult to stream. Stretching our palette to more expensive tastes helps us discover what else is out there in terms of quality. 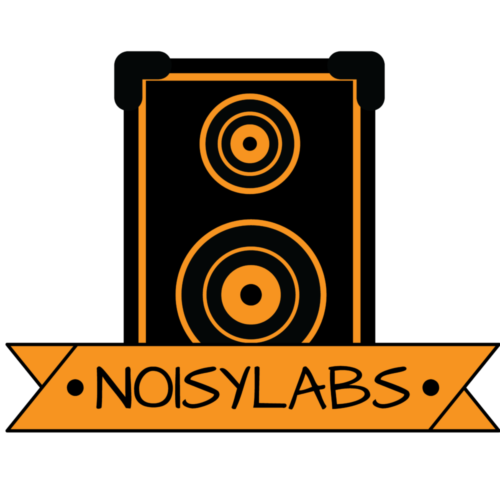 The speakers we’ve displayed so far have had woofers, tweeters, and waterproof capabilities, but we have to wonder…. With this post, we hope you learn more about wireless speakers as much as we did. Have you ever wanted a speaker that looks like it’s designed for a home theatre but can play outside? We love the design of this speaker. It’s like a hybrid of the 90’s and present times. We say that because its shape reminds us of a boombox you would lay on your shoulder while walking down the sidewalk, but with modern features. The lighting on its screen display is one example of its modern features. On top of that is its Bluetooth capabilities. 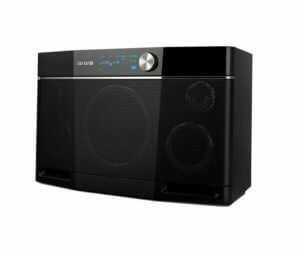 Its features allow it to be utilized as a patio speaker, backyard speaker, garage speaker, and more. Combine that with deep bass, free-distortion, and 200 watts of power, and you can play this at your next tailgate. A definite choice for someone who wants heavy music at their next backyard party. Similiar to Aiwa Exos-9, there is some serious design renaissance going on. This beautifully designed speaker is way more modern than our last speaker. One example of that is its overall shape. It looks like a flying saucer but its 3-dimensional shape mitigates that fact. What’s unique about this design besides its shape is the material they use. 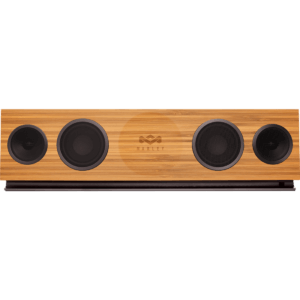 Part of its design is mahogany wood which goes on the top and bottom of the speaker. After that is the off-white grille plastered on both sides of this speaker. If we were to compare it to a speaker then we would say it’s similar to a speaker made for your home theater but much bigger and stronger. Its 180-watt amplifier combined with 2 2.5-inch tweeters deliver quality sound not comparable to anything lower-end. It also comes with 2 5-1/4-inch mineral-filled polypropylene woofers and two 1-inch silk dome tweeters. Along with that comes the patented Dynamic Balance technology that reduces distortion and unwanted resonance. A high-ticket item such as this will always bring quality sound. What’s crazy about this speaker is it doesn’t even look like one and that makes it dangerous. What we mean by “dangerous” is it will hurt people, but vice-versa. People can damage this speaker thinking it’s a pillow. Because that’s what it looks like! But with every disadvantage comes an advantage, such is life. And the advantage to this design is it truly provides a surround-sound experience. In addition to its shape is the material used to wrap the speaker which is wool, another unique part of this speaker. One factor we’re not sure about is the stitching on the speaker. When you look at the speaker you’ll see zig-zagging stitches over the speaker. For us, we’re indifferent to that feature. But we can see how it makes the speaker look more high-end. As for its sound quality, we can tell you it delivers well on all sound ranges. From lows to mids, you can expect quality at all frequencies. This makes it well-equipped for all genres. From hip hop’s heavy bass to the highs of opera music, everything will be crystal-clear to listen to. This wireless speaker is perfect for those with an outdoor entertainment center. Whenever you’re outside on a brisk night relaxing by a fireplace and want to listen to music, then this is a quality option. 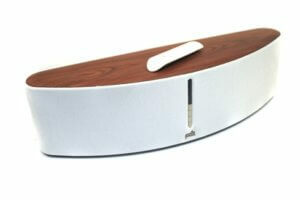 Its design is similar to a sound bar but it differentiates from other sound bars because it looks like a big log. Made up of varnished oak, the company went for a real vintage design matching up with the name of the speaker. The bad news about this speaker comes in 2 different forms. 1 problem is its height. Coming in at 9 inches tall, if you have a television and place this speaker in front of it, you might partially block your television. Another downfall to this speaker is its wall-mounting capabilities….guess what? There are no wall-mounting capabilities. To top it off, which makes 3 issues, is it’s heavy. Once you set it down somewhere, make sure you’ve committed to that position or else you run the risk of straining your back. Even though it’s wireless and is considered Bluetooth doesn’t mean you can just lug it around with you in the backyard. Don’t confuse this speaker to a Bluetooth speaker. This is a wireless speaker that considers itself as “hi-fi”. Connectivity issues aren’t a problem. You know what’s great about this speaker and its connection? It can connect to any device because it has a proprietary controller app. Imagine throwing a swimming party. When you’re the master griller and DJ at the same time, how convenient would it be if you can change songs right next to you on the grill using your phone without the speaker being right next to you? The strongest feature for this speaker in terms of sound is its bass. But let’s dive deeper into the sound architecture. Its enclosure gives it a deeper effect for its bass. Inside its enclosure are 3 tweeters, 6 drivers, and 3 mid-woofers. You know how a speaker separates its sound quality from others? By achieving a diverse sound frequency range which is grade A. 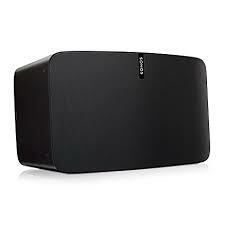 Coming from a brand that has prided itself on many wireless speakers, the Sonos Play brings expertise and durability. 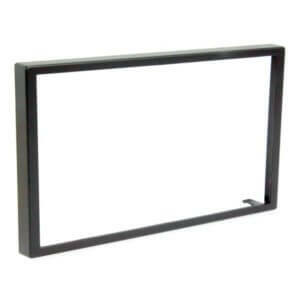 Its wide design is perfect for home theatres and open layouts such as a patio or backyard. 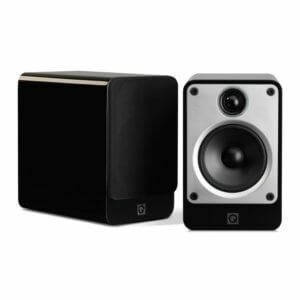 Although there’s only one speaker facing one direction, its wide-range helps the deficit it has. Its simple design doesn’t make it stand out from other designs, but when it comes to simplicity, this one takes the cake. Having a speaker that blends in with everything else adds to the simplicity of not doing too much. It’s clear the emphasis was made on sound rather than aesthetics. The speaker has plastic latches that store its internal components. It seems the manufacturers put purpose behind every single feature wasting no material. The Sonos Play:5’s best feature is called Trueplay. This feature basically modifies its sound to make the best fit for whatever environment it’s in. It works by using the microphone on whatever device you’re using to connect with the speaker and checks to see the acoustics of the environment, thus adjusting itself to make the sound better. Trueplay is similar to a Tesla model because like the Tesla, it can navigate its own path given the right situation. From sound to design, the Q Acoustics Concept 20 is like the brother to the Sonos Play:5. To start off, let’s talk about the design it possesses. 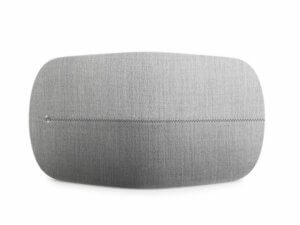 It actually looks like a plain speaker. There is nothing fancy about it and that’s the appeal. With every simple beautifully-designed project, there is a purpose in every feature. And for this speaker, the first we noticed was the facia plate. The facia plate clamps a butyl rubber sheet on its front side to minimize cabinet resonance. The foam bung on its rear-end provides an entry for a reflex port so the speaker can either sit back on a wall, or chill out on the corner. That versatility is a great option to have if you plan on having a party at your place because you can move it to wherever the party actually is. Its sound is crisp although it needs work on the bass. From the low-mids to the razor-sharp highs, sound distortion isn’t a problem for this speaker. One downside for people who are more budget conscious (which makes us wonder why you’re here), is it’s passive and needs an external amplifier to bring out more of its sound. Polk is one of the best brands on the market for high-quality speakers. They constantly pop up on whichever lists we round up and consistency is a pillar of greatness. One common trait amongst Polk speakers is the sound quality. The clear mid-range of this speaker is a defining factor of this speaker. The highest of highs or the lowest tones of tones is easier to excel at for an expensive wireless speaker than actually excelling in the mids. Its a nod to the engineering feat of Polk to balance the internal components to make its mid frequencies stand out. A criticism we have with this speaker is its bass. We understand if your speaker isn’t as good for mid frequencies, but bass? Testing the volume out all the way is the only way to hear all the bass it can pump out. In addition to this speaker, you might want to add a subwoofer, or 2 to make sure it’s booming if you’re going to go outside with it. If we were to have our “most affordable” option then this is the one. It’s a nice complement to a home theater system that doesn’t need too much power. But it can also be a nice sound set for your outdoor space. This goes great with songs with a lot of mid and high frequencies. Its design isn’t splattered with rich color, it’s the polar opposite. The design is bland. A lot of black and copper covers the speaker. Not much in terms of appearance but you should care more about sound quality anyways. On a positive note, its molded rubber construction reduces harshness and minimizes sound disruption. 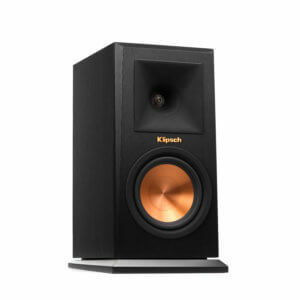 Its lightweight cerametallic woofers are light to maintain rigidness and speaker efficiency. A lightweight woofer also helps against sound disruption and cone breakup. If you’re going to place these bad boys outdoors then make sure they’re going to stay there because these weigh in at 72 pounds. Only plan on moving it if you know for sure you’re strong enough to. Otherwise, you’ll risk dropping it and ruin your investment. Also, if you want bass, then please buy these. Packed with a 12-inch subwoofer and a 15-inch passive radiator placed on the rear of this speaker, this placement is designed to disperse its low frequencies at a greater efficiency. Because the passive radiator is located on the rear, this radiator works on acoustic pressure generated by the woofer so the bass has a greater output. This is what makes its bass appealing. How is the sound frequency well-rounded? Even though we highlight its bass as its definitive feature, don’t discount its mid and high frequencies. Compared to the competition, it stacks up well. 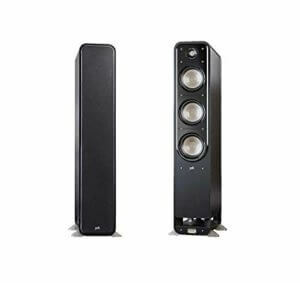 And the reason it covers many sound frequencies well is due to its high-efficient speakers. Complete with state of the art drivers which include titanium tweeter compression and midrange drivers, it’s no wonder it displays powerful audio. Furthermore, the Forte 3’s tweeters are also classified as horn drivers. Continuing on with the efficiency theme, horn drivers are better than box speakers because it disperses sound like a straight tunnel. Instead of acoustics being thrown on the walls, ceilings, and floors, the speakers point straight ahead. Further expanding on its sound, its patented technology also lets you tweak with the mids and adjust control of the mid-frequency band. 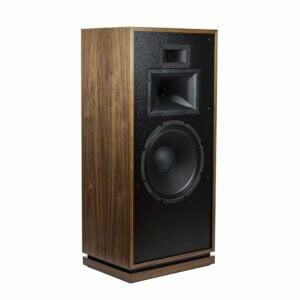 Besides its audio features, Forte is a classic brand well-known because of their quality in producing towering speakers.